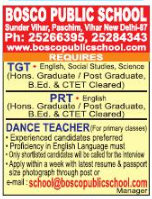 Bosco Public School, New Delhi has advertised in THE HINDUSTAN TIMES newspaper for recruitment of Teachers TGT / PRT jobs vacancies. Interested and eligible job aspirants are requested to apply within a week from 12th February 2019. Check out further more details below. About School: We aspire to transform each student into multifaceted personality. We also aspire & desire that each of our students should set an example for others to follow, by the virtue of his positive deeds & optimistic approach towards life.Children at Bosco blossom under the love and affection of their teachers. How to Apply: Interested and eligible candidates are requested to send CV wit copies of certificates and one recent PP size photo to the email address mentioned below.